I was relaxing in front of a warm fire in my Arizona cabin with a brandy and an adventure story set in the inner world of Pellucidar. After a long day of fly fishing I was ready to relax and enjoy the peace of the cabin. I felt a chill down my back of my neck first, then I heard the clank of metal on metal. I turned and in the doorway I saw the figure of my old friend John Carter. dressed in the harness and clothing of Barsoom, the planet we of Earth call Mars. "Kaor," I said, using the Martian greeting. I put down my novel and faced him. "It has been months since you last visited earth." "And so it has," he said stepping forth and taking a seat on the wicker chair next to mine. "I felt a need to talk to a fellow American to keep up my English language skills. Life has been peaceful in Greater Helium. I find that there are just too many meetings and fancy parties. Dejah loves them but for me they are droll and interminable. I am a man of action. I would rather leave diplomacy to diplomats." "I understand," I said offering him a brandy with a motion of my hand. He shook his head no. He did see the rather lurid cover of my novel. "A story of the inner world of Pellucidar," he said with a smile. "Its an exciting tale," I answered, "but totally implausible." "Did you know that Barsoom also has an inner world?" he asked. "I did not know that. Have you visited this place?" "I was kidnapped there with my daughter by a strange, savage race that dominates the inner core of Mars." "Tara was with you?" I inquired. "No, my youngest, Valla. It was there that she almost lost her life and it was in that place I almost lost a battle." "You are here now, so I guess you came away victorious." "Would you like to know of my misadventures at the core of Mars?" he asked, looking at the cover art of my book. "I am interested," I said as I retrieved my trusty leather bound notebook and pencils. That night he told me this tale. He wasn't finished until the bright dawn came up over the Superstition Mountains. I present the story to you as best I can recall of John Carters' own words. I hope you enjoy it as much as I did hearing it. I was presented a copy of the "Pirates of Venus" when I was twelve years old. That one book started my life long love of all things Edgar Rice Burroughs. I read everything I could find that he had written. I liked the Tarzan Books but I found his stories of Mars, Venus and Pellucidar most entertaining. When I read everything I could find, and missing the thrill of his imaginative works, I began to write my own Burroughs style adventure on "Big Chief" pads. I wrote my first novel (really a Novella) when I was just fourteen. It was an awful story -- looking back. But it set me on my path to be a writer. In the years and decades that follow I have penned some 65 books -- and 22 have been published! But, though I have written ghost stories, history, adventure novels, biographies, and steampunk stories I have never lost my love of Edgar Rice Burroughs and his many worlds. I heard of a book titled "Tarzan in the Core of Mars." A rather poor effort really inferior to "Tarzan on Mars." but I started to think I might be able to do better. Only, rather than have Tarzan -- I would use John Carter. It was a fun project and one that I hope you will enjoy. 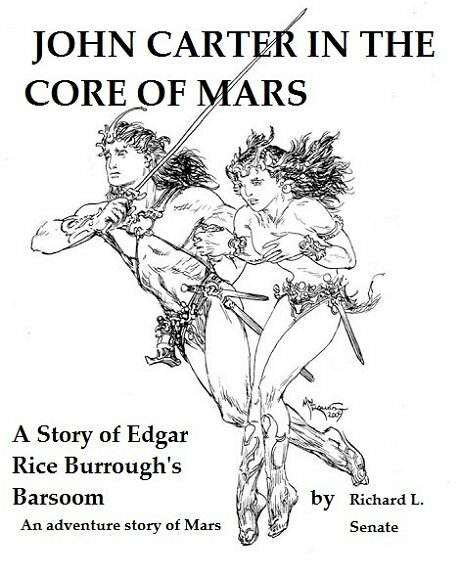 It is a sequel to "Tarrid, Green Man of Barsoom" published in ERBDom Magazine. It tells the story of Valla, the youngest daughter of John Carter and Dejah Thoris and her misadventures in the distant city of Zor. I created the character of Valla and made her a hot headed, spirited young woman that I based on my daughter Sarah. The story of the Core of Mars, stands alone and there is no need to read "Tarrid," to fully enjoy the tale unless you would like more backstory and how Valla was forced to mature. The Core yarn also introduces Turan, Valla's guard and future husband -- how he is a no nonsense warrior cut in the same cloth as John Carter. In many ways Edgar Rice Burroughs was my teacher and mentor in my writings and I feel honored to help preserve his name and universe in the Edgar Rice Burroughs Magazine: ERBzine. 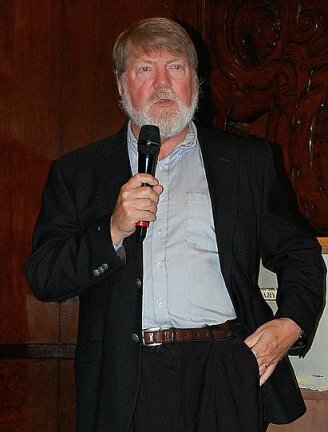 ~ Richard Senate, Ventura, California.